Apparently not too happy (OK, “seething”) about the news coverage that James Mattis’s resignation letter received, Trump forces Mattis out two months early, names Shanahan acting defense secretary, report Philip Rucker, Dan Lamothe and Josh Dawsey at The Washington Post. Patrick Shanahan, Mattis’s deputy and a former Boeing executive, will take over as acting secretary on January 1. Moving on to a new investigation by Andrew Ross Sorkin at The New York Times that reveals How Credit Cards Are Used to Finance Mass Shootings. On Twitter, he explains, “I've been working on this NYT project for months: Many of the deadliest mass shootings in the US were carried out by killers who used credit cards to buy high-powered weapons+ammunition that they couldn’t otherwise afford. No one was watching.” “Banks and credit card companies unwittingly financed mass shootings in Orlando, Las Vegas, and Parkland, @andrewrsorkin shows in a special investigation. They also have the ability to flag mass shooters before they kill—if they use it,” tweets Nick Confessore. “Amazon owns IMBDb, GoodReads, Twitch, Audible, a 10,000 Year Clock made of a mountain, a truck that dispenses raw steak alongside tech stuff, & so SO more no one has ever cataloged the 180+ parts of Amazon’s empire before, so @lmatsakis and i did it.” Paris Martineau links to her new story with Louise Matsakis at WIRED, which shows Why It’s Hard to Escape Amazon’s Long Reach. Read that one to discover all the things Amazon owns that you had no idea Amazon owns. At NBC News, Alex Seitz-Wald and Jonathan Allen go Inside Bernie-world’s war on Beto O’Rourke (40,000+ shares), and Heidi Moore says, “I am amazed at anyone who does NOT consider two years of this to be untenably exhausting.” Here’s David Sirota’s take: “This is a story that exemplifies how too many political reporters are too lazy to do the hard work of reporting on campaign finance data & congressional votes, and instead fabricate fake horserace storylines that take no work to manufacture out of thin air.” But at least there’s some comic relief? Because Ben Dreyfuss says, “I cannot stop laughing at the quote in the kicker of this story.” There’s also a quote about the relative coolness of reading Karl Marx vs. live-streaming doing your laundry. Seriously. As Rich Juzwiak explains it, “I couldn't get Mariah Carey to talk to me, but that's never stopped me before, so I did this,” which is his New York Times piece on The Defiance of Mariah’s Lambs and how Mariah “epitomizes what it is to be one’s own greatest competition.” “This Christmas (and every day LOL) @RichJuz gives @MariahCarey the respect she deserves,” tweets Caity Weaver. A gift that keeps on giving. In her latest column for The Washington Post, Margaret Sullivan lays it out for us: Here are the best and worst things that happened to journalism in 2018. Meanwhile, Christopher Schuetze of The New York Times reports that Der Spiegel Will Press Charges Against Reporter Who Made Up Articles. In potentially more hopeful journalism news, Myanmar court due to hear appeal in case of jailed Reuters reporters, report Shoon Naing and Simon Lewis of Reuters. In an interview with David Ignatius of The Washington Post, Syrian Kurdish commander Gen. Mazloum explains What Trump’s Syria decision means on the front lines of the fight against the Islamic State. Reading this one, Andrew Nelson says, “The evil in the world is sometimes difficult to fathom.” At The Washington Post, Louisa Loveluck and Jason Bernert write from Syria, where Assad’s government is doubling down on executions of political prisoners, and Syria’s once-teeming prison cells are being emptied by mass murder. In an op-ed for The Washington Post, Bruce Blair and Jon Wolfsthal explain why Trump can launch nuclear weapons whenever he wants, with or without Mattis. Colin Moynihan and Ali Winston of The New York Times have obtained previously unreleased video from the Oct. 12 violence in Manhattan involving the Proud Boys and antifa protesters. Turns out, the Proud Boys initiated the attack, not the other way around, as Proud Boys founder Gavin McInnes had initially said. Moynihan and Winston’s latest finds the Far-Right Proud Boys Reeling After Arrests and Scrutiny. And finally today, rest assured, the Santa tracker will still run despite government shutdown, AP’s Dan Elliott reports. 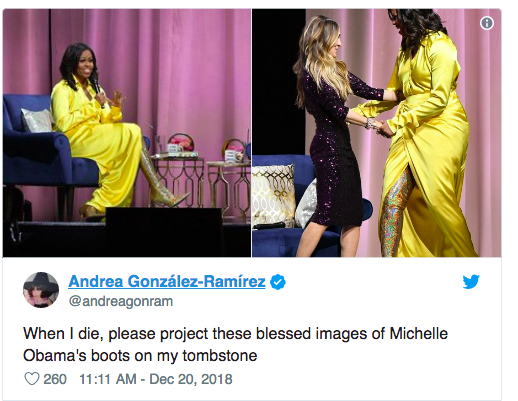 On Friday we asked: Which designer made Michelle Obama’s thigh-high glitter boots that broke the internet when she wore them in New York this week? Answer: She was in head-to-toe Balenciaga, including those glittery thigh-high boots. Congrats to…Eugene Hunt, first to tweet the correct answer. Your question of the day for today is…George Carlin said he was once nearly fired from a DJ job for playing what Christmas song repeatedly?